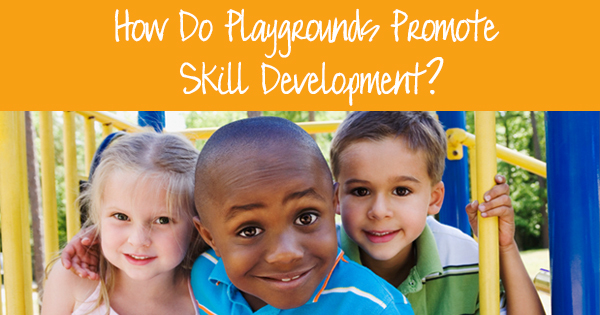 How Do Playgrounds Promote Skill Development? When people think of skill development for children, their first thought generally gravitates towards learning in school. But one activity that many people may not consider to help with skill development is playing on a playground. Kids of all ages can learn and develop important skills while on the playground, and this article is going to look at a few of those skills. Physical: The most obvious skill that is developed when kids play on outdoor playground equipment is physical skills and fine motor skills. While kids don’t necessarily play on playgrounds for the benefits of physical activity, they certainly get a lot of exercise running, jumping, and climbing on playgrounds. This playtime can contribute to the recommended 60 minutes of moderate exercise children should get every day in order to maintain a healthy weight. Being physically active on playgrounds can help kids better their balance, flexibility, movement control, and more. Overall, when kids are simply having fun on the playground, they’re developing important physical skills they’ll need to maintain a healthy, active life. Social: With the right playground equipment services, a playground can become a place that kids of all ages, backgrounds, and abilities can come together to have fun. Kids can have the opportunity to interact with other children, whether it’s on a church playground, daycare playground, or other school playground equipment. When kids come together to play on playground equipment, they’ll learn important skills needed to interact with others, share and take turns, and build relationships in general. Playing with other kids can give children a boost of confidence and help them develop their individual personalities. Cognitive: As they continue to grow, children need regular play to promote proper brain development. Playing on playground equipment can ensure children’s’ neurological development is supported and they’re getting the necessary brain stimulation. When children are faced with problems on the playground, whether it’s sharing turns or a game they’re playing, their brain is exercised along with their body. Language, reasoning, and problem-solving are just a few of the many cognitive skills that can be developed when kids play on playground equipment on a regular basis. As you can see, with the right playground equipment services, schools, churches, and other establishments can promote skill development in children. Regular play is essential to the development of a variety of skills, and providing kids with an accessible playground is a great place to start.